Alexa Johnson is Public Relations Manager at Visit Bucks County. She has been a PPRA member for 1 year and serves as Website Chair on the Programming Committee. PPRA: Alex, tell us a bit about your background and your current job. 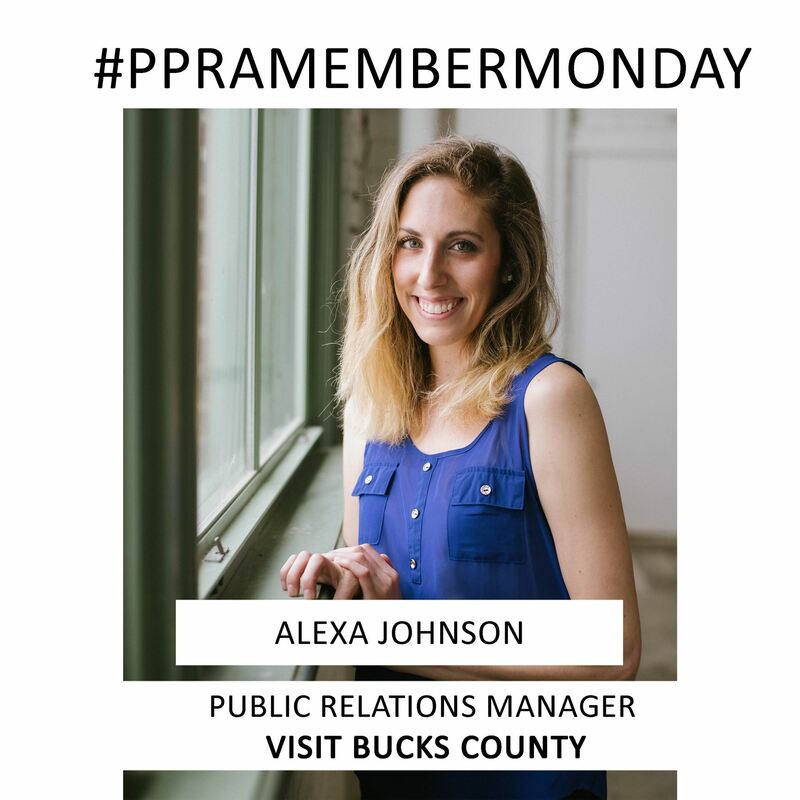 AJ: As the Public Relations Manager at Visit Bucks County, I work on pitching story ideas to national media, booking press trips, organizing large-scale publicity events, managing our video inventory, monitoring our Twitter and LinkedIn, and do a lot of writing and networking! I previously worked for a boutique beauty PR agency in New York City. I worked on accounts like Hayley Williams' hair dye brand Good Dye Young and would go backstage at Fashion Week to discuss the latest nail trends with beauty editors. On the side I do freelance family photography and calligraphy for weddings. I graduated from James Madison University. AJ: We currently operate on a fiscal year, so I am focusing on making sure my next 6 months plans are in place. We'd love to get an in-market event off the ground next Spring. This past Fall I organized a "pop-up pumpkin patch" event at Secaucus, NJ train station where our team spent the first day of Fall handing out 4,000 mini pumpkins to NYC commuters! Fall is Bucks County's prime season, and the northern NJ crowd is a main target audience. I'd like for us to get down to D.C. next! AJ: I recently took over managing our video assets. Video is something I've always had an interest in. I took a class on film making and screenwriting in college. I used to put video recaps of the year together for my sorority, and then of events we hosted for clients at my previous job. Right now I am working on having video shot of our 8 largest towns & main streets. It was so much fun producing the first one last week (Doylestown). I did everything from scouting the locations and models, to working behind the camera with the director. I'm also working with some freelance videographers to put together short and sweet clips highlighting unique attractions for our social media. I'll write the scripts and give them direction on what to shoot and edit. Working on video, as well as being encouraged to attend PR conferences all over the country (gotta love to travel if you're going to promote it! ), are my favorite parts of my job. PPRA: What was your latest & greatest accomplishment at your job? AJ: Finding out we've won a gold HSMAI (Hospitality Sales & Marketing Association International) Adrian Award for our 'Photo Walk' series. It was an initiative I spearheaded. Pretty cool! AJ: Quality over quantity. I used to panic if I only secured a few placements at the end of the month (OK, maybe I still do). If it's a modest number but they're top notch media that are definitely hitting you're target audience, then you've done you're job well. AJ: Marie Antoinette. It's pretty anticlimactic, but I love the costumes and sets. It'd be a fun time period to live in. PPRA: What's your favorite spot in Philly (museum, park, store, etc.)? AJ: I love running along Kelly Drive. Also a big fan of Ripped PHL classes followed by take-out from HipCityVeg. AJ: I don't — I'm a vegetarian! PPRA: Our PPRA 2017-18 PRoactive partnership is with Tree House Books. What was your favorite childhood book and why? AJ: "Love You Forever" always stood out to me. Such a tearjerker.